THE scenario had been acted out many times before. A V-twin Harley-Davidson was locked in combat with a four-cylinder Indian, their riders crouched over the tanks with the throttles at the stop desperately trying to gain those few feet that would say " my bike’s best " . It was a classic battle, one which could be witnessed along main streets in just about any U.S. town on a Friday night in the 1940s. Except this time, there wasn’t a Chevy pick-up in sight. The riders weren’t fuelled by milk shakes and bourbon and there were no John Travolta or Olivia Newton-John lookalikes lining the sidewalks. In fact, this particular race took place in Scotland, in 2000 – nearly 60 years after the last Indian rolled off the production line. It didn’t happen courtesy of a time machine, which transported participants back to the factory in Springfield, Massachusetts. It happened because life-long Indian enthusiast Alan Forbes is bringing the name back to life with his version of the four-cylinder Indian Dakota cruiser. You only have to glance at the machine to realise this is as close to a modern-day version of the old Indian Four as you’re likely to get. It is long, low, wide and stylish in the classic American tradition. At the centre sits a huge finned 1845cc engine, complete with four shiny downpipes and a high-level exhaust running straight as a brave’s arrow down its right side. The idea to resurrect the name first entered Forbes’ mind in March 1997, when a group of Swedish Indian fans revealed their attempt at a replica at Daytona. Called the Wiking, it had an air-cooled, two-valves-per-cylinder engine, shaft-drive, a four-speed gearbox derived from a BMW and many other purpose-built parts. With Indian spares being thin on the ground in Sweden, the men behind the project – Sture Torngren, Mikael Jonsson and Bjorn Johansson – had to use whatever they could find to finish the motor, so they adapted a camshaft, crank, pistons and conrods from a Volvo car engine and the valves from a VW. The chassis was largely designed from scratch, with a long twin-downtube steel frame creating a huge 1740mm wheelbase, though the front end, comprising Showa forks, a fat 16in Avon Roadrunner tyre on a wire-spoked wheel and a single front disc with twin-pot caliper, was taken from a Harley. Once Forbes had seen it, there was only one thing on his mind – production. 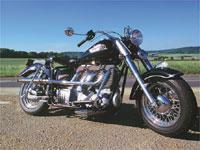 Inevitably, the bike has the feel of a Harley as you settle into the low-slung saddle. But when you hit the button to bring the big motor to life with a flat four-cylinder bark rather than a V-twin thrap, you know you’re in for a very different ride. As you lift your boot on to the footboard, pull in the clutch and tread it into gear, the Dakota lurches to one side with a Moto Guzzi-like torque rock from its longitudinal crankshaft. The engine idles sweetly and the refined feel is only marred by a ticking fuel pump – audible over the motor – which will be changed for a quieter item on production models. The motor will also be different on the finished version, being tuned to put out 74bhp rather than the 60bhp of this prototype. A more important number, though, is the revs at which peak power arrives – 3800rpm. The maximum torque figure of 124ftlb is delivered at just 2650rpm. Predictably, that gives the bike a lazy, low-revving feel as you let out the clutch and tweak the light throttle to send the Dakota surging forwards. Forbes plans to develop a fuel injection system to replace the single Weber carb as an optional extra, but the Indian is still very easy to ride, pulling from a standstill without a glitch (though it pinked slightly under hard acceleration, suggesting the ignition needs fine-tuning). With a weight of 310kg (682lb), the Dakota is roughly as heavy as a Harley Fat Boy, as well as 100mm longer. But despite those big cylinders much of its weight is carried low down, which aids stability. Once under way the Indian feels as solid as a Great Plains buffalo. On the open road it cruises effortlessly at 60 or 70mph, feeling relaxed and smooth, though with just enough high-pitched vibration to give it a bit of period feel, and a distinctly different character to any V-twin. There’s a wedge of stomp available if you need it, too. On open roads the Dakota rumbles forward with pleasing enthusiasm, and I was surprised to see the speedo nudge 100mph after just a short blast. Its top speed is probably about 110mph, slightly more for 74bhp versions, giving performance which is a match for any current Harley. Forbes proved as much when he took on one of the Milwaukee machines in that impromptu race with a friend in Edinburgh recently. " I got the better of him more times than he did me, " Forbes grins. More importantly, the four felt as if it would happily cruise at any speed up to 80mph for ever, or at least right across both Dakotas if necessary. Though I didn’t ride anything like that far, the comfort from the blend of Fournales air shocks (an alternative to standard Koni springs) and the sprung saddle, which is occasionally rather bouncy, is promising. As for the handling, it’s fine as long as you don’t get too carried away. I swept through a series of bends at 70mph without any hair-raising moments, but the combination of soft suspension, long wheelbase and low-slung chassis means I didn’t have to lean over far before solid parts hit the Tarmac. The Showa front forks are tried and tested parts that do a good job, and the same can be said of the brakes. The single front disc and old-style Harley caliper, with a drum at the rear, is low-tech even compared to the latest Harley fitments, but the Dakota stopped well given a firm squeeze on lever and pedal. Some riders may find the shaft-drive torque reaction lurch off-putting, especially when blipping the throttle to change down at slow speed, but you get used to it. Finding neutral in the otherwise efficient, if quite slow-shifting four-speed gearbox also takes a bit of practice, but after an hour or so I just about had it. Torngren has developed a revised box, with a taller top ratio, that will be fitted to production Dakotas. will find very appealing – though perhaps less so at a hefty £27,612. Some people will doubtless dismiss any Indian built in Scotland and Sweden rather than America, and claim that Forbes is just the latest of a long line of chancers attempting to exploit the famous old name. Others would argue that he has more right to build a new Indian than just about anyone else alive. He owns the British rights to the name, though the U.S. rights are owned by the Indian Motorcycle Co, formerly the California Motorcycle Co. That means Forbes can’t sell the Dakota under the Indian badge in the States, though he is still in talks to try and make this happen. Either way, at least he has begun producing a motorcycle, not just talked about doing so like many others. If Indian is to return with a line of new bikes, this would be a damn good way to start.